I had set the alarm clock for 3am so I could function as Catherine's alarm clock service. She was on the east coast and so I woke her at 6am over there. After that I was fully awake and after browsing on the computer for the weather conditions in Calistoga (and finding those to be excellent), I left Davis at 3:30, took I-80, 12 and 29 and arrived at the trailhead at 5am. Fun driving during the night, as there was very little traffic. I found the parking area without any problems. It is located nearly 8 miles north of Calistoga (along CA-29), just north of the pass, before entering Lake County. I had been here once before with Catherine 3 years ago and I recognized the setting immediately, even though it was completely dark. It was supposed to be a night with an almost full moon. When leaving Davis, the moon had been in plain sight and I was looking forward to hiking with it acting as my flash light. Sure enough, however, when I entered the Napa Valley, the moon was barely sitting above the horizon and when I drove through Calistoga, it had completely disappeared. It was still a relatively light night, and I used the flash light only on the trail during the first mile. After that the trail follows a fire road, which is wide and smooth enough to be walked on without a flash light. The road only gradually inclines and leads up the mountain in wide switchbacks. Hiking up it at night reminded me of climbing Shasta. I really liked the view of the areas surrounding Shasta at 3 o'clock in the morning when we got to Helen's Lake. Sure, it was a bit more spectacular, but this early morning view of Calistoga, Santa Helena and Napa in the distance were very nice as well. 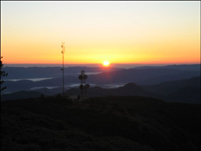 I arrived on the summit at 6:30 and enjoyed the nice sunrise in the east (which occurred at 7:09). Awesome views of Helena's own shadow and other higher points in the area, notably Diablo, Tamalpais, Snow Mountain, the Sierra Buttes, and Lassen Peak and Mount Shasta. I stayed until 7:25 and then jogged back to the car. On the way down I took the fire road all the way (instead of the trail on the last mile). It intersects with CA-29 just 500feet north of where I had parked and is therefore not much of a detour. I got back to the car around 8 and was in my office at 9:45. Not a bad way to begin the day.